You’ll remember that we started this module by considering changes in global coffee prices. 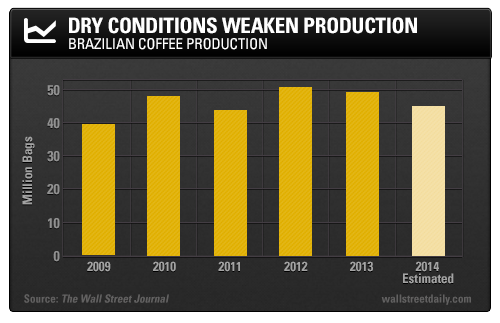 Let’s focus specifically on the drought of 2014 and see how the drought in Brazil affected supply and demand for coffee. Now that we understand more about supply and demand, we can answer a few important questions: How does a drought impact supply? What impact will the quantity supplied have on the equilibrium price? Figure 1. 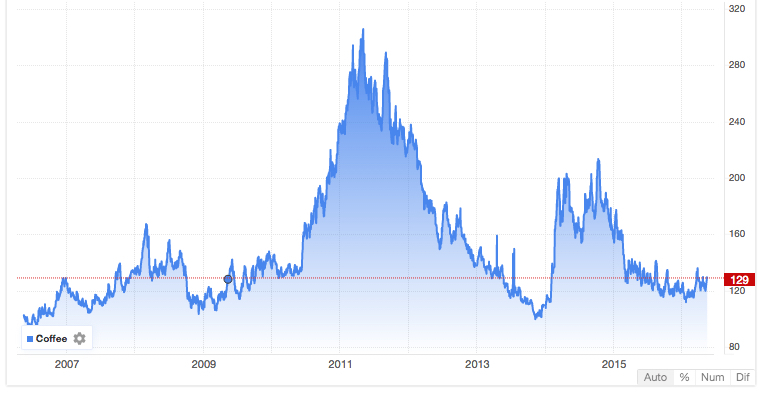 Coffee prices between 20017 and 2016. Source: Trading Economics. In 2014, the coffee regions of Brazil experienced a serious drought. The lack of rain in Brazil’s coffee-growing region delayed the tree-flowering period, which spans October and November. When the trees don’t flower, they don’t produce coffee. Weather conditions also affect the pollination of coffee trees that have already flowered: drought makes the blooms very delicate, which can cause them to fall off the tree. In 2014, the combined impact of these consequences meant a 13 percent drop in production from the previous year, to only 48 million 60-kilogram bags. Figure 2. The change in the millions of bags of coffee production over time. These are poor natural conditions for coffee growers, and they cause a reduction in the supply. Graphically, such a reduction means a shift to the left in the supply curve (shown in Figure 3, below), indicating that suppliers are providing less coffee at every price. Figure 3. Poor weather conditions results in a leftward shift in the supply curve. We can see that this shift in the supply curve will change the quantity supplied and the equilibrium price. At the original price (P1), the decrease in supply causes a shortage—more people want coffee at that low price than the suppliers are able to provide. This drives up the price to a new equilibrium level (P2). 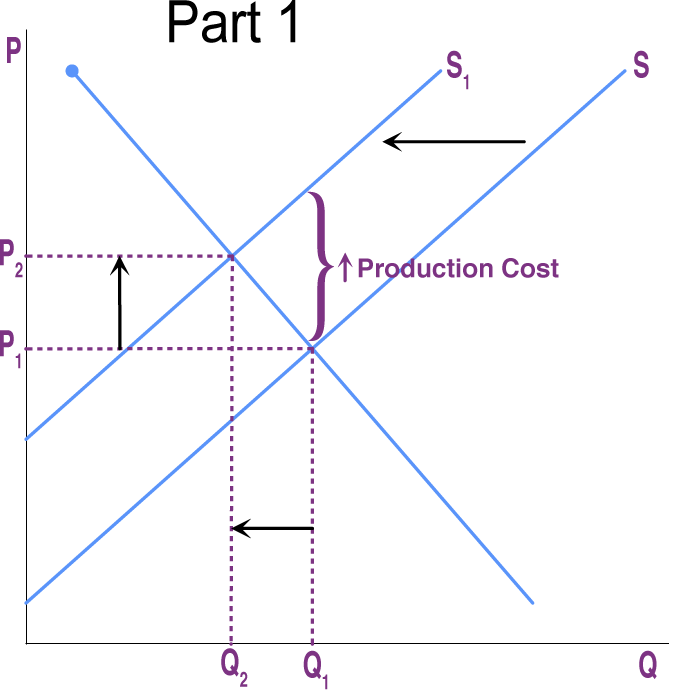 In short, a leftward shift in the supply curve causes a movement up the demand curve, resulting in a lower equilibrium quantity (Q2) and a higher equilibrium price (P2). This impact is clear in an economic model like the graph above, but does it really affect consumers? Absolutely!—during this period, Starbucks raised its prices by 8 percent, and Folgers raised its prices by 9 percent. Coffee retailers were able to limit some of the impact of the rising coffee prices by drawing down their stock of green beans that were purchased before the drought and passing on some of the cost on to their customers as a higher price. Some people—call them the coffee addicts—continue to drink coffee and pay the higher price. Others switch to tea or soft drinks. No government commission is needed to figure out how to adjust coffee prices, which companies will be allowed to process the remaining supply, which supermarkets in which cities will get how much coffee to sell, or which consumers will ultimately be allowed to drink the brew. Such adjustments in response to price changes happen all the time in a market economy, often so smoothly and rapidly that we barely notice them. It’s very common to see the impact of drought and other natural factors on supply, equilibrium quantity, and equilibrium price. The following video provides a brief example in the United States.